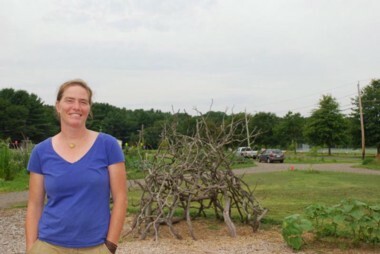 When I arrive at the Florence Organic Community Gardens, Pandora Redwin is standing a couple feet off the ground, balancing on a wooden post and tending to a tarp that stretches out over her. Next to the tarp structure, several smoothed logs stretch out in a circle. The logs rise from a center and are attached by nails to other short logs that have been secured into the ground. Across the tree stumps from the tarp structure is a teepee-like object covered in bean stalks. On the other side of the circle is a structure built of interconnected wooden branches, several of them pointed and flimsy-looking. Next to that, three juggling pins lie on the ground. The ground is covered with wood chips. Redwin had suggested we talk here, at this playground she built at the community gardens (she is on the board of Grow Food Northampton). The term “playground,” however, may not be the best descriptor, as I explained to my seven-year-old a few days later. “Is there a slide?” he asked. Redwin steps down, and we take shelter from the hot summer sun under the tarp. At two events this summer—the first at Look Park in late June, the second on the courthouse lawn in downtown Northampton in late July—Redwin has hosted Pop-Up Adventure Playgrounds in the hope of building support for her developing nonprofit The Play Workshop. She is also the staffing coordinator and instructor for Adventure In Adventure Out, and has a two-year-old at home. Eventually, Redwin wants to create “a permanent site for a full, European-style adventure playground where children literally build their own play spaces,” she says. Ideally, it would be similar to The Land, the infamous play space in Wales that was featured in “The Over-Protected Kid,” the cover article from the March issue of The Atlantic. The Land is nothing if not startling. Recalling that article, I tell Redwin that it looked like it was designed after a Hunger Games movie set. The Land occupies about an acre of fenced-in space at the end of a neighborhood. It is staffed by a few playworkers who monitor the children, but rarely intervene. Redwin’s pop-up playgrounds have not been so stylistically post-apocalyptic, though they do draw from the same adventure playground philosophy of using moveable objects and loose parts—such as duct tape, rope, and cardboard boxes—to encourage creativity and self-reliance by offering kids a chance to make and direct their own play spaces. A third and final summertime pop-up workshop takes place August 16 from noon to four at Maine’s Field in Florence. All three events are in collaboration with the Northampton Recreation Department, through Redwin says she hopes to talk with Holyoke as well. Carroll notes that presently the city has no official plans to build an adventure playground, but says they will be talking with Redwin more at the end of the summer. In 2008, Lenore Skenazy gained notoriety as “America’s Worst Mom” when she allowed her 9-year-old son to navigate his own way home from Bloomingdale’s, in downtown Manhattan, to their New York City apartment. It’s a humorous take on a most serious question: how do we—parents, educators, society at large—most effectively raise our children? Redwin’s Play Workshop, like Skenazy’s book and the aforementioned Atlantic article, is part of a burgeoning movement that advocates allowing and encouraging children to have more undirected experiences of the sort their parents enjoyed a generation ago. This past winter, the British-based Pop-Up Adventure Play conducted a 10-day pop-up workshop at the Berkshire Museum in Pittsfield. A play space at the Ithaca Children’s Garden in New York is known affectionately as the Anarchy Zone. The Play Workshop seems a culmination of the many experiences Redwin has had throughout her life. She grew up on a farm in Ashfield, and has been an experiential educator for decades, working several years for Outward Bound. As I precariously walk down one of the log structures Redwin has built at the Florence garden, she discusses the notion of “perceived risk versus actual risk,” noting that we routinely put our children into cars, knowing that they are more dangerous than any play structure a kid might interact with at a crazy-looking adventure playground.